Luton boxer Linus Udofia brushed off a chaotic fight week with victory against Lancashire’s William Warburton at York Hall on Friday night. The 30-year-old (24-127-10), was an eleventh hour replacement on the Hayemaker Promotions show, after Udofia’s original opponent had visa issues just days before their scheduled bout. 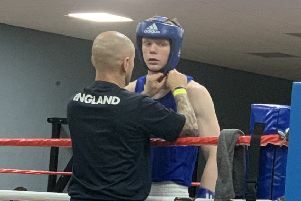 Unperturbed by the changes, the former Hockwell Ring ABC fighter put the pressure on his opponent right from the first bell. With just seven fights under his belt, the Luton middleweight has already shown a great ability to cut off the ring and to force his opponent into retreat with a high guard. Against Warburton, this allowed him to offload spiteful left hooks to the body and to push through stiff jabs to head in the early rounds. With the fight ebbing away from him, Warburton tried to rally in rounds three and four but this only served to open up his defence and Udofia picked his shots at will. When Warburton did try to get on the inside, Udofia showed great strength in holding him off for what was yet another comprehensive win, with the referee giving every round to Udofia who now moves to 7-0. Afterwards, he said: “I think he wanted to start slow and then try and go for the big punches in the late rounds. “I just worked the body and made sure I narrowed the ring. He seemed to be trying to survive from the start, which is fair enough as he’s a very experienced fighter.